"The Frontier Supperclub series is about having some foodie fun and getting to know each other and some beers. 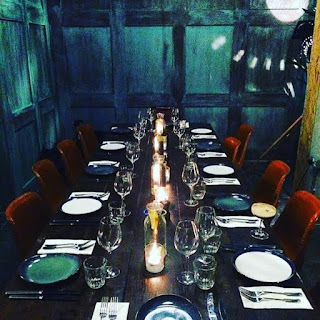 Sit around a 12 person dining table to enjoy an intimate dinner party with an ambitious 4 course menu in newly opened North London restaurant, The Common. Beer Sommelier, Ben Sedgwick, and Head Chef, Andre Miguel have designed each course around three different beers to maximise the flavours found within. Stick around to enjoy the venue's live music and then take home goodie bags filled with beers, bottle openers and vouchers. Simple, Sharing, Pairing - that's what this Supperclub is about and at £35 per head, it's exceptionally good value. From 7pm on 1st, 2nd 3rd December. 12 people . 3 specially selected beers . 1 dining table .